THE STUFF THEY WRITE ABOUT IN BOOKS Smoking out front of Dakota with Fiachra and Karl at Brenda’s emigration-to-Australia do, the talk turned to horses— I didn’t do it! Did I? How is it that anybody talks to me anymore? I mirrored Nikki’s assessing gaze, a look that, on both out parts, had to do with readiness. ‘Should I?’ Make the decision for me! ‘If you want to.’ Damn! I’d noticed Delilah. Dark bay, one of only three mares in the school, beautiful. ‘Hey, Delilah.’ I go into her stable, undo her throatlash, unwrap her reins, do up the throatlash, led her out. I had bonded with Argo— or he with me— or both— without much effort. Geldings are like that. Mares, however… well, I’d read about mares. We stand, waiting to mount. She’s not giving me much. Once, in the barn, I’d given her a good scratch on the withers, and she’d reached over and started mouthing at my shoulder, grooming me back. I tried this again. The look that horse gave me. Shot back over her left shoulder, ears pinned back. The look that horse gave me. ‘Sorry, Dee Dee.’ Whoops. Didn’t like that, either. It all went downhill from there. Narrower and spritelier than Argo, I struggled to find a rhythm, trotting with less grace than Delilah preferred. She spooked when Nikki came to fetch my whip to give to somebody else, and then, realising that I was sans crop, proceeded to plod, ignore my aids, toss her head, and finally refuse to keep up the trot at all. Throughout it all, frustration built up on top of embarrassment into anger. By the end of the hour, I didn’t want to give her a wee pat, much less a big one. Once on the ground, we stood side by side, silent, cold shouldering. I was annoyed with her. I was furious with myself. 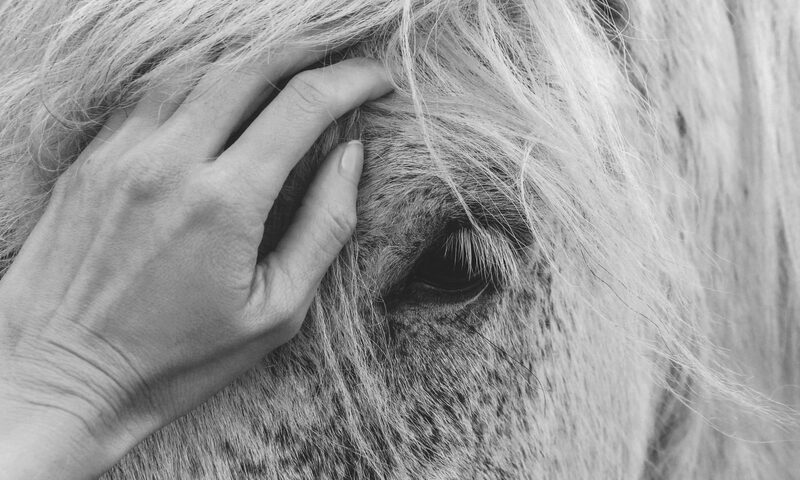 And by the time I got home, I was ashamed— blaming her entirely, when she was simply dealing with the rider she was dealt, and I was not gracious in the end. I booked myself in for Thursday. I passed Emma in the carpark and asked for Delilah. Knowing of the Argo-Sue confederacy, Emma seemed surprised, but agreed. I went into the barn. She was in her stable. I felt a wave of remorse. Somewhere— maybe at the second ‘sorry’— she slowly shifted, swung around to face me, and cut me off, gently, putting her nose right up against mine, blowing, gently, allowing me to breathe back. I didn’t tell them the whole thing, just enough to assure them that the stories people tell about horses— how they know things and let you know they know— isn’t rubbish.